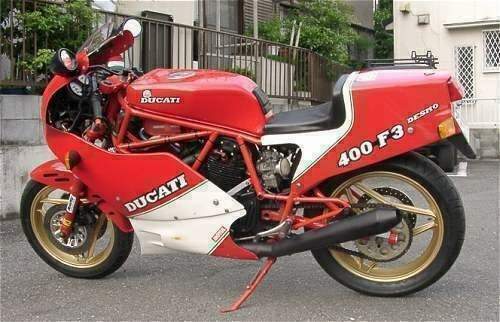 Japan was one of the biggest markets for Ducati in the 1980s but limited sport bikes to 400 cc, so smaller versions of the F1 were sold there as the F3 from 1986-88. 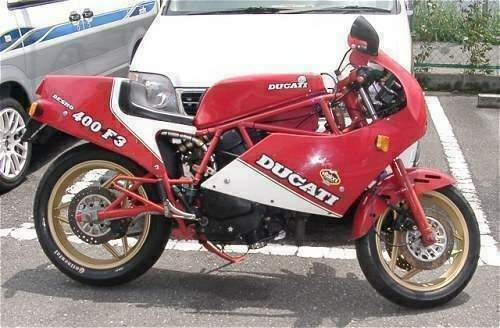 A similar restriction in Italy was set at 350 cc, and a red and white F3 was sold there in, only available in 1986. The Japanese 400-cc F3 generated 47 horsepower, while the Italian 350 F3 made 42.5. Basic suspension was fitted to the little bikes: 35-mm Marzocchi forks and 260-mm dual discs with Brembo callipers. The two models each weighed 397 pounds, and the 400 F3 was tested at 110.8 mph, which is quite respectable. 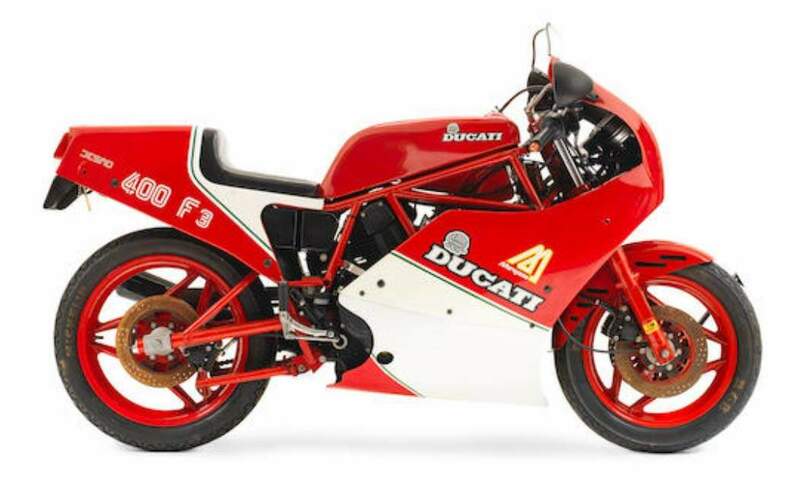 Considered by many enthusiasts to be the last of the 'real' (pre-Cagiva take-over) Ducatis, the race-styled F1 and F3 first appeared in 1985 and 1986 respectively. Ducati had already enjoyed considerable success with its Pantah-derived F2 racers in FIM Formula 2 racing so a '750' version was the logical next step. 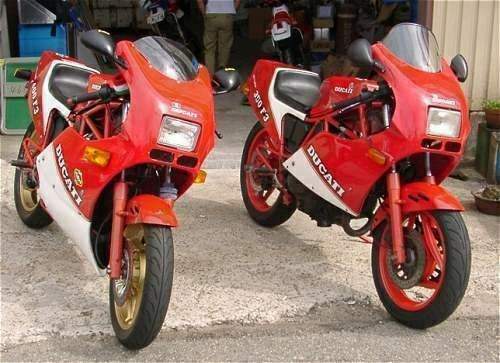 In 1986, the 350cc and 400cc F3 versions were introduced, intended for the Italian and Japanese markets respectively. Both of these smaller models used the 750 F1's frame; clearly visible above the deliberately cut away fairing sides, the new chassis attracted considerable attention: a trellis of short, straight tubes, it has formed the basis of every road-going Ducati since, as well as the first Desmosedici Moto GP racers. The principal difference between the F1 and its F3 siblings was the latter's lower-specification suspension ad brakes. Only 900 400 F3s had been completed when production ceased at the end of 1988. Considered by many enthusiasts to be the last of the 'real' (pre-Cagiva take-over) Ducatis, the race-styled F1 and F3 first appeared in 1985 and 1986 respectively. Ducati had already enjoyed considerable success with its Pantah-derived F2 racers in FIM Formula 2 racing so a '750' version was the logical next step. 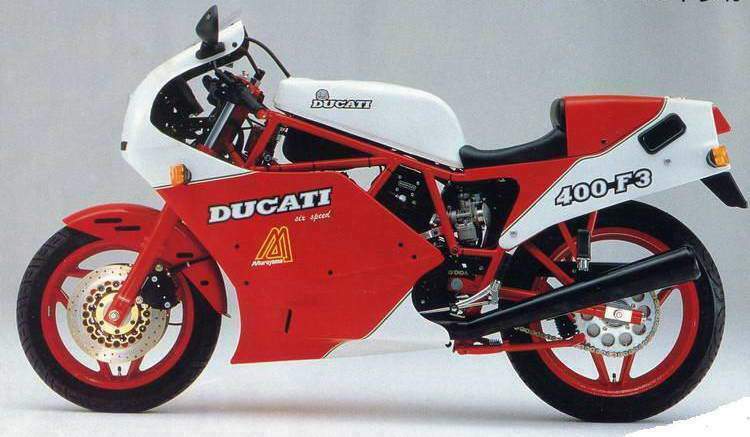 In 1986, the 350cc and 400cc F3 versions were introduced, intended for the Italian and Japanese markets respectively. Both of these smaller models used the 750 F1's frame; clearly visible above the deliberately cut away fairing sides, the new chassis attracted considerable attention: a trellis of short, straight tubes, it has formed the basis of every road-going Ducati since, as well as the first Desmosedici Moto GP racers. The principal difference between the F1 and its F3 siblings was the latter's lower-specification suspension and brakes. Only 900 400 F3s had been completed when production ceased at the end of 1988. Offered from a private collection, this Ducati 400 F3 will require re-commissioning before returning to the road, and would benefit from detailing. The bodywork appears to be in generally good condition, though there is damage to the indicators. The odometer reading is 327 kilometres. Prospective purchasers should satisfy themselves with regard to this motorcycle's originality, correctness, and mechanical condition prior to bidding. There are no documents with this Lot, which is sold strictly as viewed.